A magnificent mansion in Los Angeles once owned by boxer Muhammad Ali is taking a swing at the market for $16.9 million, according to the Wall Street Journal. Ali, who died in 2016 at the age of 74, lived there during his marriage to his third wife, psychologist Veronica Porché Ali. The couple bought the estate in 1979 and lived there until their divorce in 1986. Built in 1916, the home last changed hands in 2001 for $2.5 million. If the sellers get close to the asking price—even considering any cash they’ve invested—they will walk away with a heavyweight profit. Set behind the private gates of Fremont Place, the 11,545-square-foot home sits on 1.6 acres of parklike grounds, and includes nine bedrooms and seven bathrooms. The large guesthouse contains an additional bedroom and full bath. Designed by architect John C. Austin, known for his work on the iconic Griffith Observatory, many original details remain, including Tiffany stained-glass windows, chandeliers, and stone fireplaces. The home has also undergone renovations over the years, according to the Real Deal. Other standout features include a skylit sunroom, floor-to-ceiling bookshelves, and outdoor space that includes a pool. 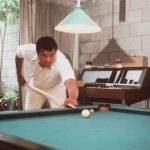 According to the Journal, during Ali’s time, many bold-faced names visited the Greatest at this residence, including Sylvester Stallone, Clint Eastwood, and Michael Jackson. Ali, a professional athlete, activist, and superstar, is considered one of the greatest boxers of all time. In 1967, he refused to be drafted into the Vietnam War, citing his religious beliefs, a controversial decision in that era. Along with his conscientious objector stance, he became a voice in the civil rights movement.